We are excited to introduce the super-stylish Industrial Turner Stool Light Wood, a vintage styled piece with rustic character. Bringing an authentic antiqued aesthetic to your kitchen or bar, the Industrial Turner is just an incredible design. A compact twist on a classic industrial backless design, its solid light wood seat boasts a unique natural patina that will lend warmth to any interior. 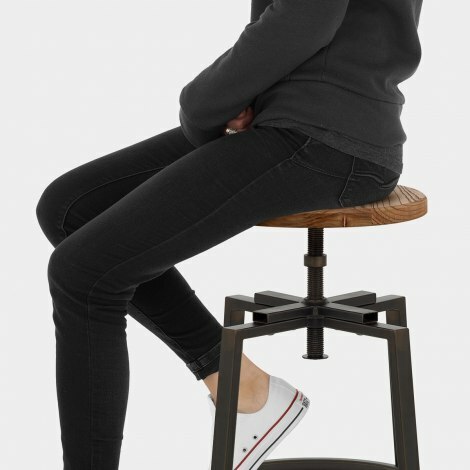 Resting on a contrasting cross-shaped metal frame, the seat can easily be moved up and down at your convenience thanks to an exposed screw-thread mechanism. For premium practicality, a rounded footrest is included, as well as protective floor plugs to help look after your floors. "These solid stools look really stylish"
Excellent quality and looks great in our bathroom. 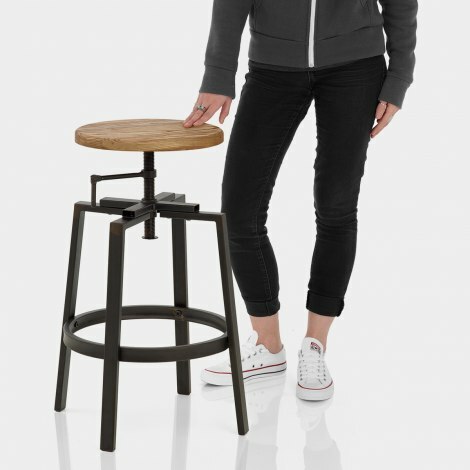 Had been looking for an industrial style stool at a reasonable price for a few months - found this ordered it - not disappointed absolutely love it - it’s stylish and comfortable - I was kept up to date all through the process - would definitely recommend. Stools arrived quickly, really nice quality, feel really solid. Fairly easy to put together. Very pleased! Bought to go with new peninsula area, wood tops and stone grey cupboards - bought three with light wood seats to go with benches, fit really well with look we were wanting to achieve. Excellent delivery and great price. Would recommend. Thank you. I am so happy with my new bar stools. They look so expensive and have transformed our kitchen. They were really easy to put together, especially by the time you move onto the second one. The added bonus was free next day delivery!! Turned up first thing the next day. Highly recommend, I am over the moon with this product.